If you have not seen this EVERYWHERE over this past weekend, you literally have been hiding underneath a rock. Finally the highly anticipated movie Black Panther was released, and all you need to know is get up and watch it now. You don't even need to finish the rest of this article -- I rather you just get up and watch this dope masterpiece. The director Bay-Area born and raised Ryan Coogler has broken down barriers. He accomplished a masterpiece. He became the first Black director to be given a 200+ million dollar budget from a studio to make Black Panther. All you need to know is when the opening scene says Oakland, no would could contain their excitement and to know the director was born and raised in Oakland just hyped up everyone even more. 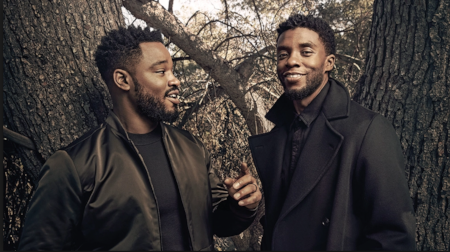 Chadwick Boseman IS the Black Panther--he embodies everything that a king is with class and charm. You will walk out of the theatre knowing no one else could play this role. Michael B Jordan -- well damn the villain but so damn good looking and brilliant. He made you want to hate him and nurture him all at once. He was made to play this role of Erik "Killmonger" Stevens. Lupita Nyong'o Danai Gurira Letitia Wright and the icon Angela Bassett are warriors, brilliant, powerful af and empowering. Their essence in the film showcased the power of a woman. In Wakanda, showcases the true nature of a woman. This is the film that every young woman should watch to see how powerful we are as women. Women are own warriors, a technology genius and no need for a man to save us. Lets be honest, we are saving them. For little black or brown girls she will feel pride to see that all type of hairstyles and rich dark skin are celebrated. Our hair is just on point. Black is beautiful. It doesn’t matter to me what you do with your hair — if you wear it straight, or curly, or nappy, or a weave, or an Afro. We’re all beautiful. Not only is this film one of the best Marvel movies in their franchise but this is a movie for the culture. I have never seen so many of us show up and show out at a movie theatre. Black Excellence. Wearing our crowns, and dashikis, looking like we are extras from the legendary comedy Coming to America. Hands down this is a cultural impact for the black community. We’ve broken records, exceed expectations, proved critics wrong that a cast prominently of black actors and actresses can do this without being typecast as a gangster, pimps, slaves or maids. We are out here, and we are brilliant. Black Panther showcased the beauty, flaws, style and in-depth essence of the black community. Without giving any spoilers- we see the turmoil between families and the black community. It provides the in-depth look at about how we define Black Excellence. We see the fight over the crown and how it affects from where you are from and where you are raised. We all know that people classify us as either “whitewashed” or “ghetto”’; depending on how you speak, dress or raised. This movie shows insight into our prejudices within our community. This movie provides insight for everyone and anyone. Black Panther isn't just another superhero movie, but it's a movie where a superhero is black. This films is for all kids from different ethnic backgrounds to watch a film and be proud of this young man who journeys now is to save the universe with the Avengers.